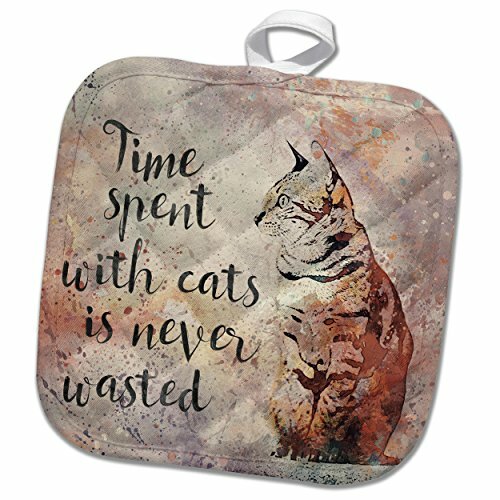 3dRose phl_264743_1 1 Pot Holder Illustration Watercolor Time Spend with Cats Is Never Wasted, 8 by 8"
Potholder is perfect for daily use, while coordinating well with any kitchen décor. This 8 by 8 inch, 50/50 cotton/polyester blend, pot holder features a quilted design which allows for more flexibility when using. Handy attached loop offers the option to hang for display or storage. Heat resistant for safely removing dishes from the oven and hot pots from the stove. Great as a hostess or housewarming gift. Check out our special offers and Product promotions listed above. 3dRose phl_263812_1 1 Pot Holder Funny Cute Llama Wearing Sombrero and Eating Taco Cartoon, 8 by 8"